The blood flow to the brain increases when you move, and research has thus proven that movement has a very positive effect on learning as focus and clarity gets better. Hopspots combines movement with the practice of several different things such as language learning, cognition, working memory etc. 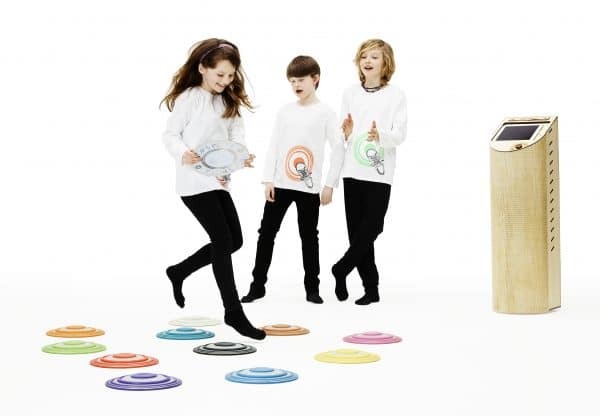 The game logics, the sounds from the games as well as the colorful spots with light in together work to motivate the children to move and learn. Therefore, children’s focus, overview and collaboration skills are improved when they play with Hopspots. The interactive learning tool, Hopspots, is with its games targeted to children all the way from preschool up to lower secondary education. The Hopspots-games The Chase, Sequence, FlowDance, Mix’n’Match and Code a Spot are specifically applicable in preschool and the intermediate stage, but the two last-mentioned games can also easily be used in lower secondary education as you can programme your own content in both Mix’n’Match and Code a Spot. When you produce more difficult content in Mix’n’Match, the game can be used in lower secondary education, and if you set the language to e.g., English, German or French, you can even use the game for language subjects. In the same way, you can record content in Code a Spot that is targeted to older schools kids. The game, The Island, is designed for children at the intermediate stage and lower secondary education, and compared to the 5 first-mentioned Hopspots-games it is more time-consuming to play and requires more from the children in terms of collaboration-, comprehension-, reading- and perception skills. In this game the pupils are stranded on a deserted island, where they have to collaborate to solve a number of dilemmas in order to survive. Every now and then they send an expedition group to Hopspots, in order to collect food, explore the island or improve the mood in the camp by using the physical spots for different exercises. Hopspots has been developed with the fact in mind that pupils have no patience and teachers no time for problems with technology, when teaching is to take place. Thus, we have designed a product that is quick and easy to set up with which the pupils can easily help. 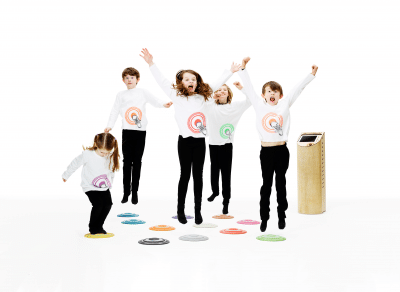 The spots have a wide range, the app is very intuitive to use, making it possible for even small children to do so, and the speaker unit is easy to move around and use when playing, and when charging or storing Hopspots. The Hopspots-games are designed to activate an entire class at once either by dividing pupils into groups or by having everyone play together, depending on the size and level of the class. In The Island pupils have to read and discuss the chapters in the game, and now and then send an expedition group (a new one every time) to the Hopspots, where they have to use the physical spots for collecting food, improving the mood in the camp or exploring the island.